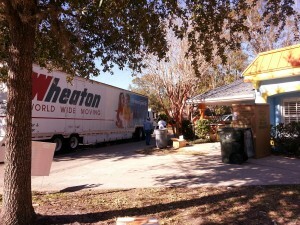 March 2nd, 2010 | Wheaton World Wide Moving. You’ve got your estimates, chosen your mover and prepared your house for moving day. But when all is said and done, you may still be confused about how a major van line really works. Picture your van line as a network of agents that work together to get your household goods from Point A to Point B. Each agent typically performs local or INTRAstate moves (moves from Point A to Point B within the same state) on their own, without the help of the major van line. As a result, the local moving truck may not include name or logo of the van line. When the same agents perform INTERstate moves (moves from Point A in one state, to Point B in another state) they use the major carrier’s network of agents and all the resources of the van line itself. An origin agent – along with the driver – will pack and load your belongings (if you’ve chosen packing services) and then drive to your destination. When the moving van shows up at your house, it will most likely bear the name and logo of both the local agent and the van line. Any of the major household goods carriers operate in a similar fashion – in which the local agent has their own local moving business, but also performs interstate moves in conjunction with the major van line. Don’t be fooled by fly-by-night brokers who simply arrange relocations without a vested interest in your move — they’ve got no trucks or equipment and they may outsource your move to a company that doesn’t have the right credentials to provide you with peace-of-mind.